The galaxy is a vast place, and for every light there lurks a shadow. On some planets, the criminal underworld is cautious, congregating only in secret. On other worlds, it operates in the open, wielding its influence like a blunt instrument and daring the forces of law and order to oppose it. 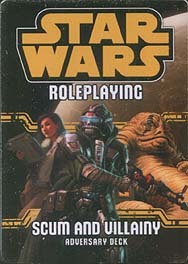 This deck requires the Edge of the Empire, Age of Rebellion, or Force and Destiny Core Rulebook and includes cards for 20 adversaries from the seedy underbelly of the galaxy.